Crispy bacon, sausage meatballs and crispy potatoes are all good reasons to cook this hash; using up all your leftover Easter veggies is an even better one. 1 Preheat oven to 180c. Set a skillet or oven-safe frying pan to medium heat and add the lardons, onions and garlic. Cook until soft. Pull the meat out of sausage skins into balls and add to the pan. Cook until browned. 2 Place the potatoes in a large bowl and light crush with a potato masher. 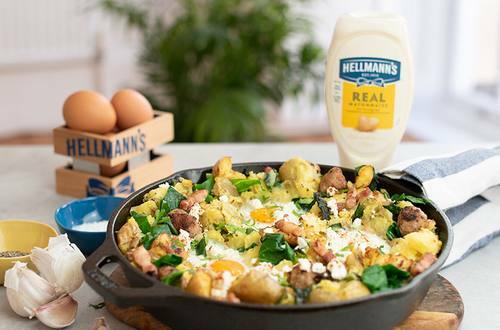 Add the leftover vegetables and the Hellmann’s Real Mayonnaise and mix well. Add the mixture to the skillet and stir through the onions, bacon and sausage and spread evenly across the pan. Cook on medium for 5 minutes. 3 Using a ladle, make 4 wells and crack the eggs in. Place the skillet in the oven and cook for 20 minutes until the egg whites are set. Garnish the hash with crumbled feta, parsley and black pepper.